When looking to inspire your kids’ creativity, search no further than your recycling bin. Glass, plastic, and cardboard are all incredibly versatile crafting supplies with an infinite number of uses. While you could just let your little ones loose with a stack of old magazines, a little direction could prove helpful (at least to get started). Continue reading for a set of crafting ideas that are both kid-friendly and make great use of otherwise tossed materials. That stack of 50 blank CDs gathering dust on your desk? Toss them into the craft bin for an easy circular (not to mention shiny) art supply. 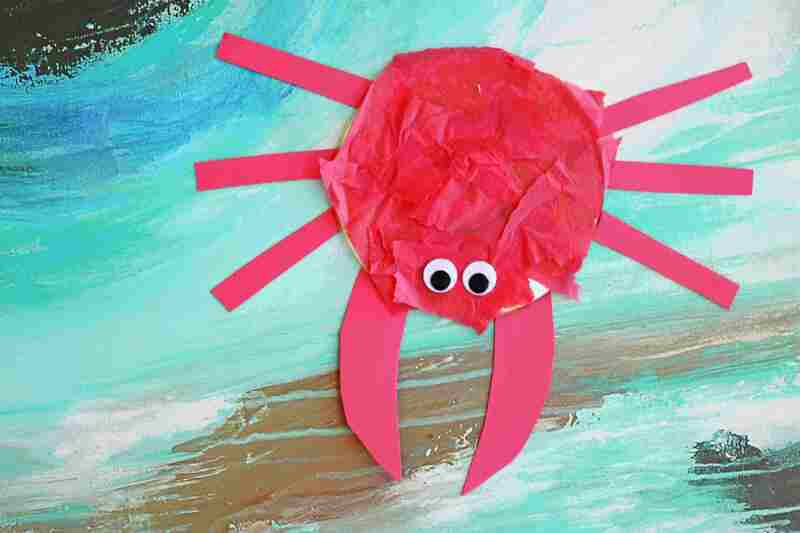 Kids can cover CDs in tissue paper, then add wiggle eyes and construction paper limbs for an unlimited array of critters. Try a friendly crab to get started! Snip the bottoms off plastic water bottles, then set them out to paint. The curved plastic wells act as flower petals, and the smooth painting surface lends to a textured, semi-transparent finish. Mix some glitter into your washable paint, and add fuzzy pom pom centers to complete a bouquet of recycled blooms. Adults will need to assist making drainage holes in the bottom of clean tin cans, but kids will have a great time decorating these fun planters. 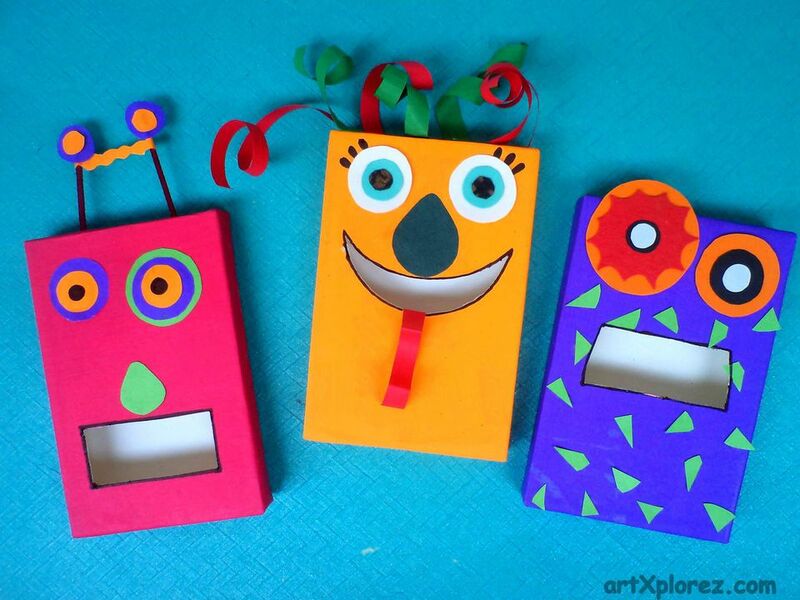 Provide paint, pipe cleaners, and wiggle eyes and create a whole family of friendly plants. Prep for an outdoor adventure with a completely homemade pair of binoculars. String two empty toilet paper rolls together, then camouflage with tissue paper leaves (or faux greenery for a three dimensional effect). This clever tutorial utilizes a few recycled goods: small screw top lids, popsicle sticks, and rubber bands. Use a strong tape to adhere the rubber bands to the lid, then attach the popsicle stick as a handle. Encourage kids to experiment with different twangy tones by using various rubber band sizes. Those empty egg cartons can be used in a variety of childrens’ crafts, including constructing a lovely little indoor garden. Clip the egg cups away from each other, then snip into petals and stack for 3D flower art. Save those empty breakfast cereal boxes in order to craft a group of fierce monsters. Add a bamboo handle, and your monsters turn into puppets ready for a performance. Decorate your creatures with construction paper, faux fur, and ribbon—the options are endless with these rectangular box bases. Thoroughly rinse a spent milk or juice carton, then either paint it or cover it in colorful construction paper. Placed on their sides, these cartons resemble busses (or submarines or wagons or trains), so create plenty of passengers to paste on as well. Add a quartet of screw-top wheels, and your vehicles are ready to zoom across the kitchen counter. Add a school of compact disc fish to your menagerie of CD creatures! Sequins and gems lend a bit of sparkle to your marine life, and these look extra adorable in a cluster hung on a kids’ room wall. Build rows of towering skyscrapers from empty toilet paper and paper towel rolls. These cardboard tubes provide a perfect base for an urban cityscape that kids will love to roll matchbox cards through or hide action figures in. Another great use for spent plastic water bottles: make a set of handy clear pouches to organize the craft table or playroom. Pair a couple of same diameter bottoms together to create two halves for a case, then use your glue gun to attach colorful zippers as closure. Kids can help decorate with puffy paint, and will (hopefully) take ownership over clean-up by organizing their items in a fun way. Transform glass jars into a clever organization hack with this adorable tutorial. Adults—spray paint a base color, then let children apply Lego man faces with marker. Don’t have a Lego fan at home? Try emoji faces instead. Either way, these decorative jars keep bits and baubles tucked neatly away. Rinse and save those leftover wooden popsicle sticks for craft time! Glue a few together for an easy base for a troll face. Add a tuft of faux fur hair and some googly eyes to finish the decoration. Hang a group of different colored trolls in the kids’ room for an easy, swappable, piece of art. Practice telling time with this handy craft. Grab a paper plate, use a brad to attach hour and minute hands, then decorate! Each learner can customize his or her own clock, encouraging ownership over their time-telling progress. Add a pop of color to the yard with this lovely little project. Grab a clean tin can and cover it in colorful duct tape, fill with birdseed, then add a length of yarn to string it to a sturdy branch. A halved plastic lid keeps the seed well contained. Little ones can be in charge of decorating and filling these. Scoop those crayon scraps out from the bottom of the bin, peel off their labels, and pop them into a fun silicon mold. Melt in the oven for a few minutes, then allow to set on their own or freeze for faster results. Those old wax bits get absolutely rejuvenated via this process, and kids will love to create with their new art supply. We love a good creative use for all those leftover shipping boxes, and this one does not disappoint. Snip out a few dinosaur torsos and legs, then slide them together using a simple cut-and-slot method. Bonus: Creating these 3D sculptures will help your little ones practice their design and planning skills. While bubble wrap could keep your kids totally occupied on its own, this clever craft takes the versatile material up a notch. Tape a length of bubble wrap into a tube, then paint it green and add a pair of bulging eyes to mimic a sneaky crocodile. A great way to organize your cabinet full of reusable food containers is to get rid of a few! Pass them off to the kids for a quick coat of paint (or glitter or paper or ribbon), then they can glue a bunch together to create an alien spacecraft. Build a toilet roll extra terrestrial to pilot your UFO, and you’ll be ready for hours of imaginative play. Is there anything better than a near-zero cost, handmade gift? Coat a clean wine bottle in craft glue, then wrap in colorful yarn. Try rustic hemp for a more country feel, or create a monochromatic set of three. Pair with a bouquet of fresh flowers and these’ll make great presents for the grandparents!